MKs and party leaders urge strong IDF response to Hezbollah attack Wednesday night, say Israel must provide deterrence. 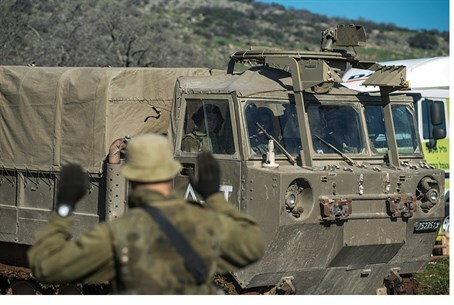 MKs and party leaders urged Israel to respond forcefully to Hezbollah's attack on Israel Wednesday, which wounded seven soldiers and killed two. "Terrorism will only bring a harsh response," Yachad-Ha'am Itanu chairman Eli Yishai stated. Yesh Atid Chairman Yair Lapid agreed. "Israel will not tolerate attacks by terrorist criminal on its territory, its soldiers and citizens," Lapid stated Wednesday night. "Hezbollah cannot hide behind the argument of the attack on them. They started the previous round, they started this round, they should know that Israel knows how to respond against attacks like this." "We will not tolerate it," he continued. "We have to manage this thing quietly and calmly. Such things will not remain unanswered." Other MKs expanded on the situation from a broader perspective, particularly regarding Israel on the international front. "I am confident and trust the hands of the IDF and the defense establishment in the decision it made regarding its convoy and I guess [returning fire] was necessary," MK Arel Margalit (Labor) stated on "Talking Gordon." "We should contain the event and be ready to act, and decide if we want to act or not." "Israel must take the initiative, which does not always just entail being on the offensive," Margalit added. "We decide for ourselves if the event will remain localized or spill over." Margalit, following the Labor 'party line' regarding US-Israel relations, then attacked Prime Minister Binyamin Netanyahu's lack of a close relationship with US President Barack Obama in times of crisis. "Intimacy between world leaders at critical moments is very important," he said. "The White House and the President and the Prime Minister must now maintain open lines of communication." "This is the main reason for my criticism of Netanyahu's actions against President Obama," he added, referring to Netanyahu accepting Speaker of the House John Boehner's invitation to address Congress without Obama's permission. "Personal relationships are revealed as critical in critical moments." "You have to try to prevent deterioration," MK Ofer Shelah (Yesh Atid) added. "The assumption is correct, I think, that Hezbollah, the Syrians and the Iranians do not want to cause escalation - but things can escalate and we saw this throughout our history." "We must wield here a lot of power and a lot of wisdom," Shelah added.